Click through for more on Chef Albert Schmid. David J. Bell was the featured speaker in this month’s Kentucky Live! series on Thursday, April 8th at Barnes & Noble bookstore. 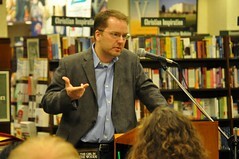 His topic was “The Missing and the Lost: “A Girl in the Woods’ and ‘The Condemned’.” A booksigning followed his talk. While honing his craft as a writer, David worked as a delivery driver, A.V. grunt in a library, bartender, bookstore clerk, and telemarketer. A native of Cincinnati, he received his BA in English from Indiana University, his MA from Miami University of Ohio, and a PhD from the University of Cincinnati. His short fiction, interviews and reviews have appeared in such journals and anthologies as: Backwards City Review; Cemetery Dance; Western Humanities Review; Shadow Regions; Wicked Karnival Halloween Horror; The Edge, Tales of Suspense; Rain Crow; and Black Pearls. His first novel The Condemned was published by Delirium Press in 2008. One reviewer called it “a wonderful, forceful, moody book that’s as palpable as it’s engaging.” The Girl in the Woods, his second novel, also from Delirium, was published in late 2009. When not writing, Bell teaches English at Western Kentucky University. Looking for a place to entertain the relatives over the Thanksgiving holiday? Come to the Kentucky Library & Museum. Featuring more than 500 pieces of furniture, paintings and other decorative art items that date from as early as 1300 B.C. to the mid-twentieth century, the Snell-Franklin Decorative Arts Gallery at the Kentucky Library & Museum offers an alternative to the usual post-Thanksgiving activities. The Civil War enthusiasts will enjoy viewing, “A Star in Each Flag: Conflict in Kentucky.” Nostalgia buffs may want to wander down memory lane in “Recommended by Duncan Hines,” an exhibit about Bowling Green’s most famous food icon. The Kentucky Museum exhibits are open every day this week but Thanksgiving Day. The Harrison-Baird Reading Room is closed throughout the entire holiday period. 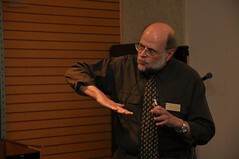 Barry Kitterman was this month’s featured speaker in our Far Away Places series. He talked about his experiences in 1970s Belize as well as about his novel and creative writing on Thursday, November 19 at Barnes & Noble Booksellers, Bowling Green, KY. A book signing followed. His first novel, The Baker’s Boy, was published by Southern Methodist University Press in 2008 and in 2009 won the Maria Thomas Fiction Award. He drew inspiration from his work as a Peace Corps volunteer in Belize in the 1970s. Set in Central American and Middle Tennessee it tells the story of a former Peace Corps worker at a boys’ training school in Belize near the Guatemalan border who thirty years later is toiling as a baker while still haunted by his earlier experience. Kitterman spent almost a decade writing the novel which has drawn praise from critics everywhere. Kitterman coordinates the creative writing program and visiting writers series at Austin Peay State University in Clarksville, TN where he’s been a member of the faculty since 1994. Robert Dickey was the featured speaker in this month’s Kentucky Live! on Thursday, November 12, 2009 at Barnes & Noble. Dickey attended WKU and graduated from Centre College. Following a stint in the marines and a hitch as a reporter for the Bowling Green Daily News he graduated from Vanderbilt Law School. His first client was Beech Bend Park owner Charles Garvin. In Charles Garvin’s Dynasty of Dimes he tells the history of a man who he calls an “eccentric entrepreneur” who built an amusement park “empire” in Bowling Green, Kentucky based on 10 cent admissions. It’s a fascinating story spanning four decades, and one indelibly linked with the tourist business in South Central Kentucky. Lynwood Montell spoke at the KY Library & Museum on the evening of October 29 about his newest book, Tales from Kentucky Funeral Homes. An author of numerous Kentucky-related books and former faculty at WKU, Montell made his first appearance in WKU Libraries Kentucky Live! series. His tales of ghost stories in Kentucky and Tennessee are legendary, and his Halloween readings have been popular for many years. Montell, a native of Rock Bridge in Monroe County, founded the Folk Studies Program at WKU in 1972 and taught several generations of students there between 1969 and 1999. He’s the author of 22 books with such enticing titles as: Ghosts Along the Cumberland; Killings: Folk Justice in the Upper South; and Haunted Houses and Family Ghosts of Kentucky. In his newest book he recounts stories of unusual items in caskets, mournful pretenders, long-winded preachers, and even pallbearers falling into graves. They all serve to demonstrate the pivotal role played by morticians in Kentucky life and culture. Professor Debbie Kreitzer from the Department of Georgraphy and Geology is the first speaker in the tenth series of talks on “Far away Places with Strange Sounding Names” sponsored by the friends of WKU Libraries and the Kentucky Museum. Debbie teaches classes on World Regional Geography, the Georgraphy of North America and Geographic Information Systems. 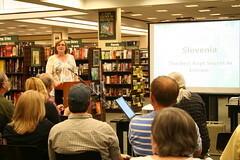 She led a Study Abroad group to Slovenia in 2007 and made a return visit in 2008. This event was held at Barnes and Noble on Thursday September 17th at 7:00 p.m.
Mr. Guillerman spoke as part of our Kentucky Live series on Thursday, October 15th at Barnes & Noble on Campbell Lane. Michael D. Guillerman worked for the Peabody Coal Company from 1974 to 1991. Over his long career, his jobs included belt shoveler, timberman, shooter, drill and shuttle car operator, rock duster, and finally section foreman. Now retired, he lives with his wife Marie in Union county, Kentucky.